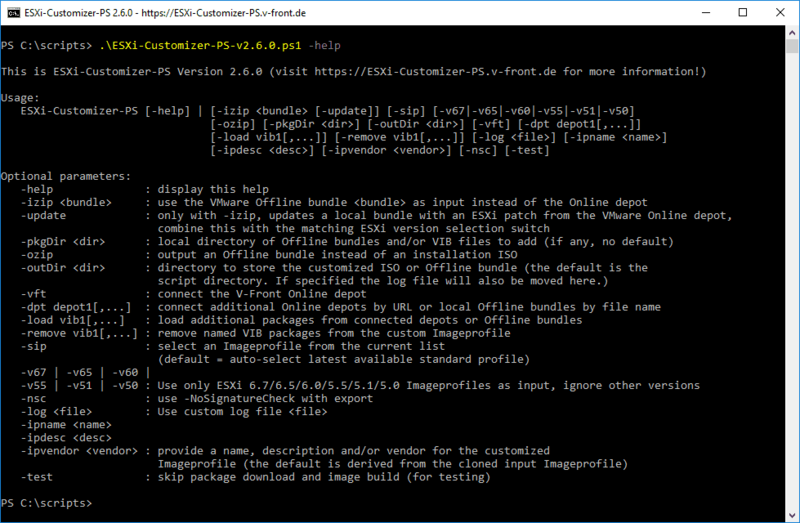 ESXi-Customizer-PS is a Powershell script that greatly simplifies and automates the process of creating fully patched and customized ESXi 5.x and 6.x installation ISOs using the VMware PowerCLI ImageBuilder module/snapin. With all three modes you can optionally add bundles from the V-Front Online Depot, any other Online Depot (by URL) or locally stored Offline Bundles and VIB files (e.g. downloaded drivers or software packages). -outDir : Write the ISO file to a custom directory. If this switch is used then the script's log file will also be moved here and named after the Imageprofile name and timestamp. -sip : Do not automatically use the latest image profile (= patch level), but display all in a menu and let me select a specific one. The menu will be sorted by date starting with the latest one. It will also list the image profiles that contain only security fixes and/or no VMware Tools. ESXi Offline Bundles can be downloaded from the VMware Patch Download portal. Some hardware vendors (e.g. HP) also provide their customized ESXi version as Offline Bundles (these can be found on the vSphere download pages), and you could finally create your own customized ESXi Offline bundle using this script. The command above will create an ESXi installaton ISO from the ESXi 6.0 GA Offline bundle. Again you can modify the behavior by using -outDir, -sip and/or -ozip like described under a). This script call will build the latest ESXi 5.5 installation ISO with the NIC drivers added that were dropped with ESXi 5.5. These packages are still in the VMware Online Depot, because they are part of all ESXi 5.0 and 5.1 image profiles, and the script just re-adds them to the latest ESXi 5.5 image profile. This will make the script connect to the V-Front Online Depot and add the sata-xahci and net55-r8168 packages from there to the latest ESXi 6.0 Imageprofile. This command will add all Offline bundles and VIB files that are stored in the directory C:\temp\pkg. This way you can add 3rd party or community supported device drivers and software packages. With this script call you update a local ESXi Offline bundle (in this example: the HP customized version of ESXi 6.0 GA) with the latest ESXi 6.0 patch from the VMware Online depot. When using -update please also specify the ESXi version that matches the one of the local Offline bundle (-v65, -v60, -v55, -v51 or -v50). -test : this is for testing the validity and effect of the specified parameters without actually building the output file. Can save a lot of time, because it also skips most downloads from the VMware Online depot. -nsc : Use the -noSignatureCheck option with the export function. Try this if you get an error message like "Could not find trusted signer." because of packages with missing or invalid electronic signatures. -ipvendor : Override the image profile's name, description and vendor attributes. By default the name and description are derived from the original image profile by adding the string "customized", and the vendor is kept as is. A copy of the GNU General Public License is available at http://www.gnu.org/licenses/. Please check the "Known Bugs and Issues" section first to see if your issue is covered there! 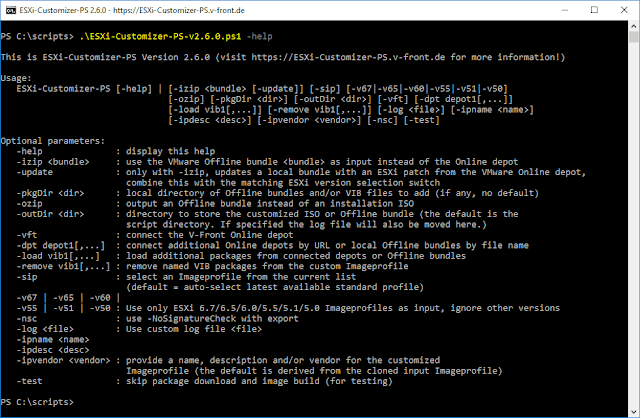 If you have trouble using the script then please send an email to ESXi-Customizer-PS@v-front.de. Be sure to include a transcript of the script execution (create it by using the Start-Transcript cmdlet before calling the script). Otherwise I might just ignore your message. For a proper download please right-click on the link above and select "Save as ..." from the context menu! If you find ESXi-Customizer-PS useful consider donating a small amount to motivate the author and support the further development. I recommend 4 EUR (approx. 5 US-$, use an Online Exchange rate calculator), but any lower or higher amount is highly appreciated. The log file that is created by the script is empty and does not include the output that you saw on the screen: This is caused by a bug in the .NET Framework version 4. A Microsoft hotfix for Windows 8.1 and Server 2012 R2 (KB3014136) is available to correct this issue. Fixed an issue with -izip -update, and the Input bundle containing multiple Imageprofiles: The script will now pick the latest standard profile from the list and update that. Added manual selection of ImageProfile to clone (-sip), naming of custom profile (-ipname) and HP Depot release selection (-hprel). Added cleanup at end of script.